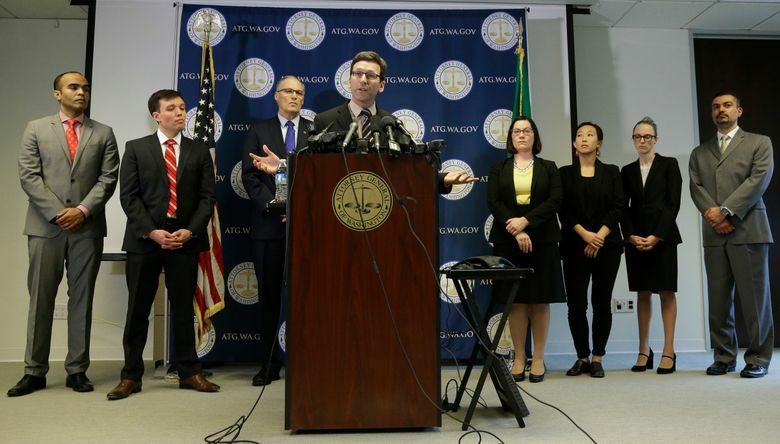 A federal judge in Seattle on Friday ordered a national halt to enforcement of President Trump’s controversial travel ban on citizens from seven predominantly Muslim nations. The White House vowed to appeal the decision immediately. 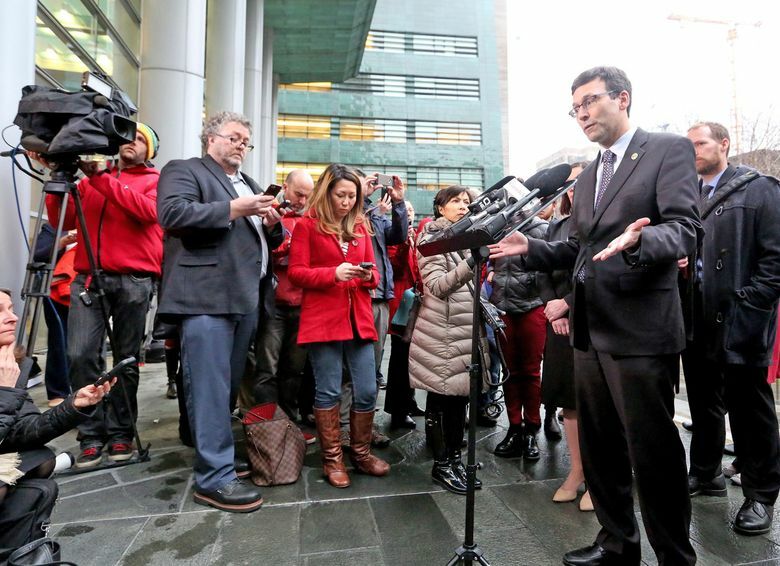 In a stunning rebuke, a federal judge in Seattle has ordered a national halt to enforcement of President Trump’s controversial travel ban on citizens from seven predominantly Muslim nations. Robart granted Ferguson’s request for a temporary restraining order “on a nationwide basis,” prohibiting federal employees from enforcing Trump’s order. The judge rejected arguments from Justice Department attorneys who said the travel ban fell well within the president’s national-security powers. The White House vowed to appeal the decision immediately. Early Saturday morning, Trump tweeted about Robart’s ruling, saying it puts into question law enforcement in the U.S.
Gov. Jay Inslee, writing on Twitter, called Robart’s ruling “a tremendous victory” for the state of Washington. “We should feel heartened by today’s victory and more resolute than ever that we are fighting on the right side of history,” Inslee said. Trump’s executive order, signed Jan. 27, indefinitely blocks entry to the United States for Syrian refugees and temporarily suspends entry to other refugees and citizens of seven majority-Muslim countries. Since the order, the State Department said it had canceled up to 60,000 visas of people from those nations. In his ruling, Robart said Washington had met the high burden to justify a restraining order by showing that Trump’s order was causing “immediate and irreparable injury,” and that the state had a substantial likelihood of winning its underlying lawsuit challenging the constitutionality of the travel ban. Robart followed up with a written ruling Friday night. Meanwhile, a contradictory decision came earlier Friday from a federal judge in Massachusetts, who sided with the Trump administration. U.S. District Judge Nathaniel Gorton ruled that the president had the authority on national-security grounds to bar citizens of Iran, Iraq, Libya, Somalia, Sudan, Syria, and Yemen, according to The Boston Globe. The disparate rulings may eventually be headed to the U.S. Supreme Court. Jorge Barón, director of the Northwest Immigrant Rights Project, said he was advising people who have been stranded outside the United States because of the ban to use Robart’s ruling to try to return. But, he also cautioned it’s a very fluid situation. Reuters reported Friday night that U.S. Customs & Border Protection told U.S. airlines in a conference call they could once again board travelers who had been barred by the executive order. But for opponents of the ban, the ruling was a momentous victory. “It’s a relief,” said Mark Okazaki, executive director of Neighborhood House, a longtime social-service provider for immigrants and refugees. He thanked Ferguson for bringing the lawsuit forward, saying it will ease some stress and anxiety. 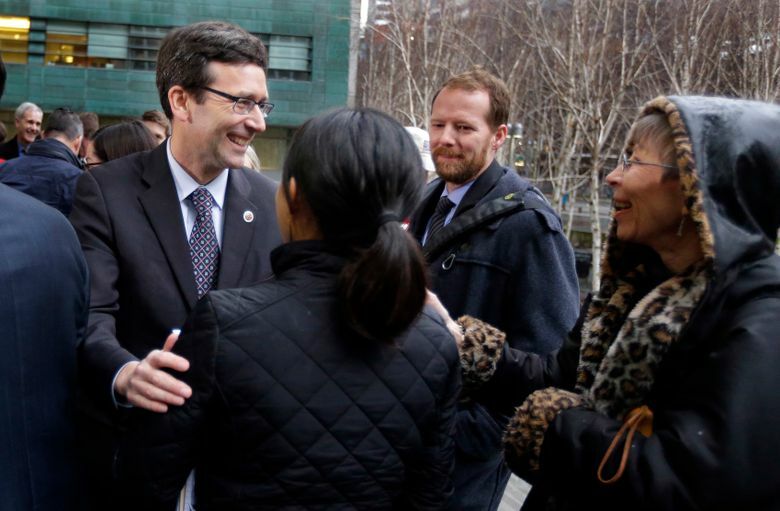 After the ruling, Ferguson grinned and hugged colleagues in the courtroom, at least one of whom was in tears. He appeared a little stunned by the moment. “Holy cow … OK,” he said. The ruling in Washington comes amid other legal battles over Trump’s travel ban in states across the country. Ferguson, a Democrat, filed the lawsuit Jan. 30, three days after Trump signed the executive order, making Washington the first state to challenge the ban. At a news conference on Monday, Susan Hutchison, chairman of the Washington State Republican Party, accused Ferguson of filing the lawsuit solely as a political ploy, to further a possible future run for governor. “I think he knows that he’s got very thin ice he’s standing on legally,” she said. Robart, who was nominated for the federal bench by Republican President George W. Bush in 2003, disagreed. He ruled that despite respect for the limits of judicial power, “we must intervene” to fulfill the judiciary’s duty to uphold the Constitution. In a legal filing asking for the restraining order, Ferguson had argued Trump’s travel ban targets Muslims, violating the constitutional rights of immigrants and their families. “Federal courts have no more sacred role than protecting marginalized groups against irrational, discriminatory conduct,” said the filing by Ferguson, state Solicitor General Noah Purcell and Colleen Melody, head of the attorney general’s civil-rights unit. In a response brief filed late Thursday, attorneys for the Trump administration said Washington state lacked standing to bring the challenge, and that the president has properly exercised his broad, border-security powers to protect Americans. “Every President over the last thirty years has invoked this authority to suspend or impose restrictions on the entry of certain aliens or classes of aliens, in some instances including classifications based on nationality,” reads the administration brief, submitted by Chad Readler, acting assistant U.S. attorney general, and other Justice Department lawyers. The administration’s legal brief also cited previous court rulings that say there is no constitutional right of entry to the U.S. for foreign nationals. During Friday’s court hearing, Michelle Bennett, a trial attorney for the Justice Department’s civil division, argued Robart should not scrutinize the intent behind Trump’s executive order because it was issued on national-security grounds. Purcell responded that such an argument was “frightening” because it could give the president virtually unchecked powers. In the state’s original 19-page complaint, Ferguson alleged Trump’s executive order violates constitutional guarantees of religious freedom and equal protection. The state of Minnesota has joined as a plaintiff. Trump and his allies have hit back against claims of anti-Muslim bias, arguing the nations subject to the ban were previously identified by the Obama administration as potential security threats. Washington’s lawsuit has been backed by major corporations, including Seattle-based Amazon.com and Bellevue-based Expedia, which have criticized the immigration order’s impact on the state’s economy, businesses and higher-education institutions, as well as on families and residents. 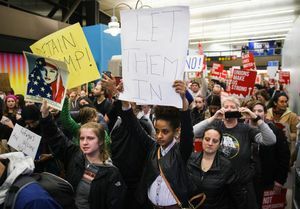 The president’s order sparked legal chaos and a wave of protests nationwide over the weekend, with a huge crowd pouring into Seattle-Tacoma International Airport amid reports that refugees and immigrants from countries targeted by the travel ban were being detained there. Some immigrant air travelers were flown back to their countries of origin, while others were allowed to enter the country with the help of immigration attorneys. More than 21,000 Washington residents were born in one of the seven majority-Muslim countries singled out in the travel ban, census data show. The state’s lawsuit said 7,279 noncitizen immigrants in the state are from those seven countries.